Join our Mini Leagues and Win Prizes! Welcome to UK Fantasy Football Info. The EPL 2018/19 season is almost here, and the English Premier League 2018/19 Fantasy Football games are now live. We've set up Mini Leagues in Official Barclays Premier League Fantasy Football, Daily Mail Fantasy Football, Sky Sports Fantasy Football, and Telegraph Fantasy Football. Once again we've helped makes thing fun by putting up prize for our Mini League Challenge*. We'd appreciate a Facebook like for that! The UK is the home of the best football in the world, so it's unsurprising that it's also home to some of the worlds best Fantasy Football. Every season hundreds of thousands of Fantasy Football managers pit their wits against each other to carefully select the players who will score the highest each week. There are many online free and paid games, with really big money prizes even for the free games. Tips and facts to help you choose your team - updated daily! The aim of this website is to give you information about all the best free and not so free UK fantasy football games, point you towards the best information to select your team, and provide a Facebook community for active debate. The main focus right now is the up and coming Premier League season which starts on August 18th 2012. Which are the Best Free to Enter Fantasy Football Games? The links in the menu on the left list all the best free to play games, and some are already live for the 2018/19 Fantasy Football Season. The prize funds for all these games is fairly significant you can still win enough to pay off your mortgage without spending a penny. 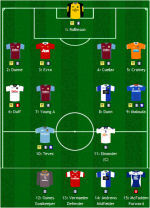 UK Fantasy Football on Facebook - When you join our leagues, post your team name here!